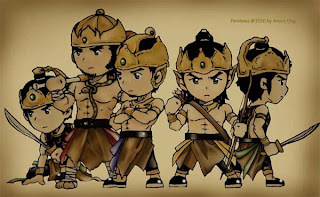 Because it has the seeds of envy and jealousy on the Five Pandavas, then Kurawa considered that the ceremony is an exhibition of Five Pandava forces, thus it is used by Patih Sengkuni to influence the Kurawa to make miserable the Five Pandavas (Son of Pandu). King Duryudhana Kurawa behalf, invite Pendawa Lima to attend the pes-ta Hastinapura held in the kingdom, for which the elders Hastinapura like Pre bu Destarastra, Resi Bhishma and Vidura Yama assess that the Five Pandavas with the Sata Kurawa have peace and friendship. Assessment Hastinapura elders were let set, because the invitation Kurawa only a ploy to make miserable representative.At that time the Five Pandavas invited to drink intoxicating drink until drunk and in a drunken state that she-jak Five Pandavas gamble, represented by the Five Pandava Yudhisthira and Hastinapur represented by Patih Sengkuni (Harya Suman). In the gambling game in the Five Pandavas defeat, because in curangi by Kurawa, gambling and drunkenness is already a daily habit for the Kurawa. Originally Pendawa Five frequent dimenang her, but after a bet is enlarged and is the target of the Kurawa, then Pendawa Lima defeated, after the kingdom Amarta stake and defeated, the situation is getting hotter, and then after her sisters and herself that made losing bets as well, the Goddess Drupadi wives at stake as well. Goddess Drupadi time kebalairung dikaputren then dragged, humiliated and pulled her hair until decomposed. That's when Goddard Drupadi pronounce the oath, that he would not be her hair again, except after shampooing with his blood brother of King Duryudhana Dursasana (Suyudhana), as well as the Milky swore, that the war Bha ratajuda will be killed King Duryudhana (Suyudhana) and drink his blood .The fate of the Five Pandavas and Goddess Drupadi a-not helped by its interference elders Hastinapura Resi Bhishma and Vidura Yama. Goddess Drupadi required to be submitted to the Resi Bhishma and given, for this the wrong he thinks resi Kurawa Bhishma wanted to enjoy his victory at Goddard Drupadi case will be handed back to the Pandavas Five by Resi Bhishma. Top Five defeat the Pandavas gambling, old te Hastina made a policy decision and the middle way, that the Five Pandavas had to undergo punishment in the forest exile for 12 years and impersonation for 1-year period, in the disguise if one of the Panda wa five can be caught, then they ha should undergo removal of all over again for 12 years, and the period of 1 year incognito. 0 Response to "The Story of Five Pandavas. Part 3"